Below, find homes for sale in Regency Park subdivision located in Warren County Ohio, or use the search button at the top right corner to search for houses for sale. There are currently 1000's of homes for sale throughout the Greater Cincinnati Real Estate market and the surrounding suburbs. Click for a detailed market report on the Maineville Ohio Area. 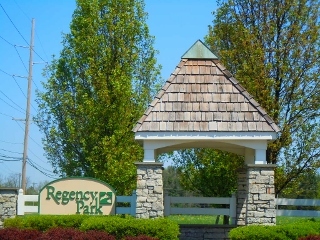 Regency Park, Maineville OH 45039, is a community of single-family homes, tree-lined streets, sidewalks, lake with a fountain, playground and professionally landscaped entrance. Stonegate Property Management (513-534-0900) is the homeowners association that governs the community. Regency Park is located in the Little Miami School District. The community is located just off of State Route 48 and is convenient to I-71, Kings Island, Great Wolf Lodge and many other restaurant and entertainment options. Contact Lynn Murphy Dickerscheid of ReMax Elite at 513-885-1673 to view any of the fine homes for sale in Regency Park. If you are considering selling your Regency Park home, contact Lynn today to see how she can market your house so that you receive the most money, in the quickest time, with the least hassle. The data relating to real estate for sale on this web site comes in part from the Broker Reciprocity™ program of the Multiple Listing Service of Greater Cincinnati. Real estate listings held by brokerage firms other than are marked with the Broker Reciprocity™ logo and detailed information about them includes the name of the listing brokers. This data is up-to-date as of . © 2019 Reliance Network and RE/MAX of Southern Ohio. All rights reserved. U.S. Reg. Copyright TX-5-910-991, TX-5-910-992, TX-5-910-993, and TX-5-910-994. Equal Housing Opportunity.